The Economic Impact study concludes that Valenciaport generates 39,000 jobs with salaries above the Valencian average. 25% of the jobs generated by the port are created in the maritime neighborhoods. The President of the Generalitat shares the objective of working to be the third port in Europe. 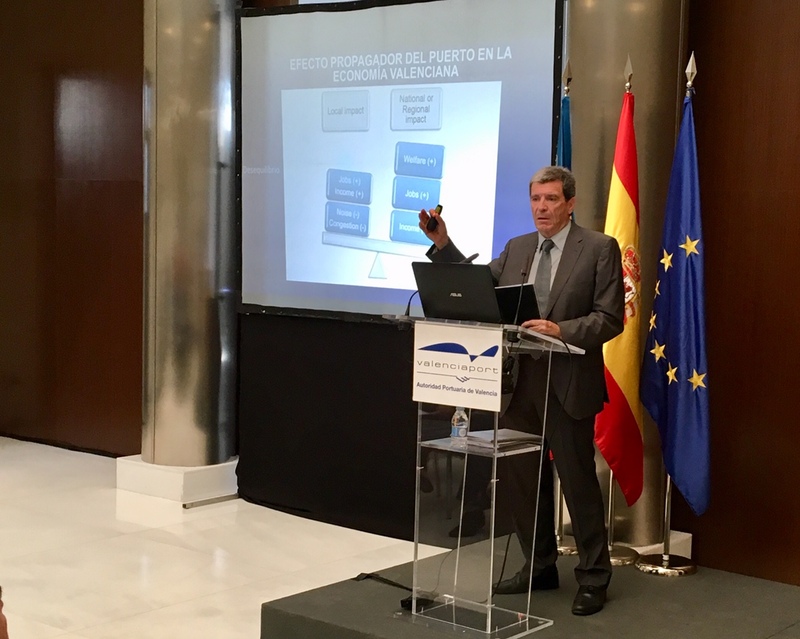 The president of the PAV, Aurelio Martinez, explains that when the investment projects planned for the next few years are completed, Valenciaport will become the third port in Europe. Valencia, October the 4th 2018. – The Port Authority of Valencia (PAV) has presented today the results of the study of “Economic Impact of the ports of the Port Authority of Valencia in 2016”, prepared by the Department of Economy and Social Sciences through the Research Group of International Economy and Development of the Universitat Politècnica de València (UPV). The event was chaired by the President of the Generalitat, Ximo Puig; and it has counted on the presence – in addition to the president of the Port Authority of Valencia, Aurelio Martínez – of representatives of the entire Port Community of Valencia. During the presentation of the study, the president of the PAV, Aurelio Martínez recalled that “the data of this study is limited to the positive effects of Valenciaport in the Valencian Community but its impact is much wider and reaches all its hinterland.” In particular, Aurelio Martínez has indicated that during the first half of 2018, Valenciaport has been ranked 28th in the world ranking of ports in container traffic thanks to its 96 regular lines that connect it with 870 ports on five continents. 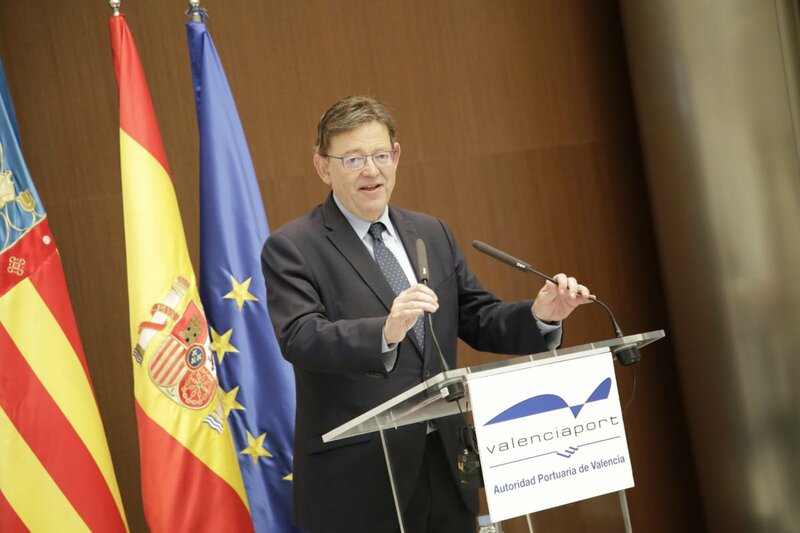 “The study ensures that Valenciaport is a very important asset for the Valencian Community. We represent 2.39% of the Gross Added Value of the Region and we contribute around 39,000 jobs, 2.09% of total employment. It is also a quality job because in salary terms we are above the regional average, “said Martinez. “The port is an infrastructure that generates qualified work; and its effect on its territory of influence increases in importance the larger its infrastructures and dimensions, its services and its international presence; so we must grow to guarantee the future. In fact, it is time to begin to consider the expansion of Sagunto, so that the new terminals are ready when the economic cycle changes, “stressed Aurelio Martínez. The president also explained that the employment generated directly by Valenciaport is distributed throughout its hinterland but is created, fundamentally, in the environment closest to the port facilities. Specifically, the inhabitants of the maritime towns of Valencia (Cabanyal, Nazaret, etc) would currently benefit from a quarter of the employment generated by the port of Valencia. Specifically, 24.2% of total jobs (Marítim) and Camins al Grau, 22.1%. During the course of the presentation, the president of the PAV also warned of the effects it would have for the Valencian economy to stop being a “hub” port (a port that serves the large ships of the transoceanic routes and from which they derive connections to others smaller ports). According to a study prepared by UNCTAD (United Nations Conference on Trade and Development), the absence of direct connections between ports is associated with a reduction in exports that ranges between 42% and 55% and the existence of any additional transshipment translates into a fall in the value of exports that varies between 20% and 25%. Applying these data to the maritime exports of the Valencia Region in 2016, the absence of a “hub” port could reduce Valencian exports by more than 3,400 million euros, which would result in a loss of more than 10,500 jobs. In the words of Aurelio Martínez, “the absence of a port like ours would imply very high costs for exporting companies in Valencia”. According to Aurelio Martínez “we are at a decisive moment for Valenciaport with the upcoming start-up of the northern extension, the new passenger terminal, the promotion of the third dock of the port of Sagunto or the upcoming start-up of logistics areas such as the ZAL or Parc Sagunt “.”All these infrastructures,” he continued, “will allow us to be among the first three ports in Europe. That is our goal and, therefore, we need to make an effort in infrastructures, such as the railway corridors, the Fuente San Luis terminal or the northern access that will reduce costs “. For its part, the president of Valencia, Ximo Puig, has emphasized that “it is an indisputable fact the importance of the port for the Valencian economy. In the absence of the port of Valencia, the export capacity of the port of Valencia would be much lower. For this reason, we support the Port Authority of Valencia in its goal of becoming the third port in Europe “. The president of the Generalitat Valenciana has concluded indicating that “the commitment of the public administrations with the port of Valencia must be constant and, therefore, I guarantee the commitment of the Generalitat Valenciana with this infrastructure”. The purpose of the report is to quantify the economic impact associated with the commercial activity of Valenciaport, and in order to do so, the data extracted from the Mercantile Registry at the close of the 2016 fiscal year has been used. The study concludes that the Gross Added Value (GVA) generated by the three ports managed by the PAV (Valencia, Sagunto and Gandia) amounts to 2,500 million euros, 2.39% This figure comes from the 683 million euros generated by the initial activity of Valenciaport and the economic impact that its activity generates in the companies of the port community, which amounts to 1,817 million euros, between direct, indirect and induced. By economic sectors, the impact on the transport and communications sector stands out, with 649 million euros; real estate and business services, with 325 million euros; and other public sectors, with 219 million euros. Regarding the impact of Valenciaport on employment, the study establishes that companies related to Valenciaport have generated 38,866 jobs. This figure means that 2.09% of jobs in the Valencian Community are related to port activity generated by Valenciaport. Specifically, in 2016, 7,303 people worked in Valenciaport, among operators and service providers. Likewise, the ports of Valencia, Sagunto and Gandia led to the creation of 31,563 additional jobs due to their direct, indirect and induced impact. By sectors, the main effect occurs in companies dedicated to transport and communications, with around 10,700 jobs, although its impact benefits all branches of the economy. As for salaries, the activity generated by Valenciaport makes it possible to distribute 1,243 million euros a year in salaries, 2.62% of salary income in the Valencian Community. Given that the employment created from Valenciaport (almost 39,000 jobs) represents 2.09% of the total of the Valencian Community, the comparison of the two mentioned percentages (2’09% of employment versus 2.62% of salaries) reveals that the remuneration of work related to the port is above average. The companies related to the port activity developed by Valenciaport obtained business profits of 1,076 million euros in 2016, 2.15% of the regional total. This means that for every euro of business profit initially originated by Valenciaport, companies that work directly or indirectly for the ports of the PAV generated two euros more. With regard to tax revenues, the study concludes that the public coffers entered in 2016 a total of 181 million euros for the economic activities linked to Valenciaport, of which 99 million euros are generated directly, 25 million euros indirectly and 69 million euros induced. Next PostNext First investments in the Valencia- Zaragoza line support the potential of the Cantabrian- Mediterranean corridor.